Got a space with acoustic issues? Ceiling tiles and panels can make a difference, but we've got some bad news for you - by themselves they aren't going to solve the problem, they'll just help. And there is no Easter Bunny.. sorry about that. Does your room echo, echo, echo..? Noise Reduction Coefficient (NRC) is your friend, and it is the most common acoustic measurement for ceiling panels. Annoying noises pounding down from the room above (or below!)? Sound Transmission Class (STC) can help reduce them. Too much information coming through your ceiling from the office next door? Ceiling Attenuation Class (CAC) can help cut down on the TMI. Buying a new ceiling tile strictly for its ability to control sound is a little like buying a new car strictly for its CD player. Some people might actually make the choice based on that single feature, but cars were no more invented as transport devices for surround sound systems than ceiling tiles were invented for their acoustics. Can ceiling tiles enhance the acoustical characteristics of a room? Absolutely, just like a Blaupunkt can make a sweet ride even sweeter. But when shopping for a car or a ceiling tile, it is probably best to evaluate the whole package and what you want from it not just how good it "sounds". The term "acoustical ceiling tile" has as much to do with marketing as it does with making a difference in the "sound environment" within a given room. Conventional drop ceiling tiles came into wide usage because they were easy to install, provided convenient access to the areas above the ceiling, and were cheap. People certainly didn't buy them because they were pretty and they didn't buy them for their acoustics. Yet, acoustically, mineral fiber tiles were significantly better than conventional drywall or the gypsum that was widely used for drop ceiling panels. Marketers seized on this as a way to differentiate these tiles as "new and improved" and began to sell them as "acoustical ceiling tiles". That name added perceived value to the product, and soon "acoustical" is what people thought of first when buying tiles for their ceiling. A conventional room has, at a minimum, six structural surfaces: four walls, a floor, and a ceiling. Unlike hot air, which rises, sound moves equally in all directions and has the potential to be reflected, to pass through, or to be absorbed by all surfaces - not just the ceiling. So, why is it that we mostly think of the ceiling when we think of acoustics? Marketing. A carpeted floor can do much more to absorb sound than most ceiling tiles, yet we don't think of buying acoustical carpeting. Wall hangings and drapes can have a significant and easily noticeable effect on the sound signature of a room, yet they are rarely purchased for their acoustic characteristics. And what about furniture? One doesn't usually shop for an "acoustical chair", yet furnishings have a huge impact on the behavior of sound within a room. Should you consider the acoustical properties of ceiling tiles before making a selection? Certainly. But it is also important to make sure that your expectations are aligned with reality. Given all the factors that contribute to the total sound signature of a room, will you be able to actually hear the difference between a tile that absorbs 50% of the sound that hits it versus one that absorbs 25%? For most people in most situations, probably not. Think of it this way: Most drivers going 60 MPH down the freeway probably aren't even conscious of the difference between a $300 car stereo and one costing $3,000. Instead, they are appreciating the entire driving experience: the look, the feel, the handling, the convenience, the maintenance, the cost, the miles per gallon of the vehicle - the whole package. 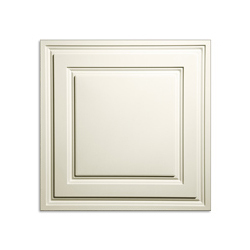 Approach your selection of ceiling tiles in a similar fashion and you can't go wrong. There are three major ratings that relate to ceiling tile acoustics: Noise Reduction Coefficient, Sound Trasmittance Class, and Ceiling Attenuation Class. Only some tiles are rated in all three categories, and the value of each rating is only meaningful in the context of the actual installation where the tile will be used. Before describing each rating, it is important to note that these values are achieved in a laboratory, and the measurements are not considered field data. Said another way: "Your results may vary," depending on where and how the tiles are used and what you expect of them. Noise Reduction Coefficient (NRC) is a general rating that tells you how much sound a surface (in this case a ceiling tile) will absorb. This rating is represented as either a percentage or a decimal, with 1 (or 100%) being perfect absorption and 0 (or 0%) being perfect reflection. In other words, the higher the decimal or percent, the more sound the tile will absorb. While this does give a very good idea of how a tile will perform acoustically, it does not tell you what happens to the sound the ceiling tile does not absorb. Sound Transmission Class (STC) is used to rate several different types of building materials for their ability to block sound and prevent it from passing through them. This is commonly used on walls and partitions, as it is very helpful in deciding which types of partitions will properly isolate different areas of a building. STC ratings are represented as a number, usually between 1 and 100, although not limited to that range. The higher the number, the better the material is at blocking sound. A rating of 10 is considered terrible, allowing talking voices to be heard through the rated system, while a rating of 60 or more makes for an excellent sound blocker. The STC rating is helpful, but does not tell you what will happen to sound once it is blocked. For example, a thick concrete wall might have an excellent STC rating, but it will send all sound bouncing right back into a room. This will keep the sound from passing through the wall, but will make for a very echo filled room. Ceiling Attenuation Class (CAC) is really a completely separate rating system. While it does deal with sound absorption and attenuation, it is a bit more specific. In an installation where a drop ceiling has been installed and walls have been installed that only reach up to the drop ceiling level, sound can pass up into the ceiling plenum, over the wall, and then back down into another room. The rate at which ceiling tiles inhibit this passage of sound is called the CAC. This rating is commonly misunderstood as a rating that describes how much sound reflects off of the face of a tile. This is a misconception, and the CAC rating should not be given as a rating to describe any situation other than the aforementioned. There is no hard and fast rule about combining these acoustical values, but it is good to be aware of them while shopping. Unless you have a very specific need, they shouldn't be the sole deciding factor in your purchase. So, how important are these ratings? If you are evaluating tiles in isolation, comparing one type to another based only on their acoustic performance, these numbers are all you've got to go on. Fortunately that isn't the case. You are also going to be considering appearance, ease of installation, price, selection, indoor air quality, availability, and a host of other things. Add these acoustical ratings to that mix, think about which overall qualities are most important in your specific installation, and in no time at all you'll know exactly which tile sounds right for you. 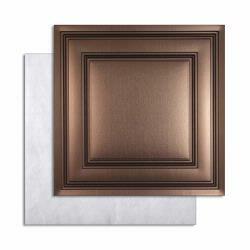 Ceilume's Acoustical Ceiling Panels - Good, Better, Best! When shopping specifically for acoustical panels, most people want to reduce echo or "noise" within a room, so they are most interested in NRC. And no wonder, a standard sheetrock ceiling reflects back 95% of the sound that hits it! The term "balance" is often used relative to sound, so Ceilume offers three choices that allow you to balance acoustic performance with aesthetics and price to create the ceiling that suits you best. 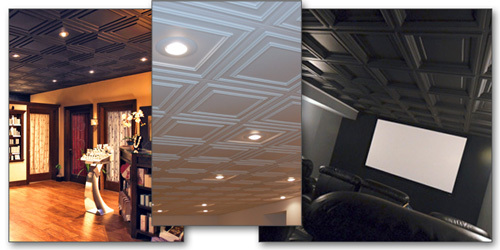 Best price-to-performance ratio that is unmatched by any other decorative acoustical ceiling. A high end acoustic ceiling panel system that absorbs 85% of the sound that hits it (over 90% in the common vocal range). Starting at $6.95 per sq. ft. Better sound absorption and designer style at a lower price per square foot for those on a budget. 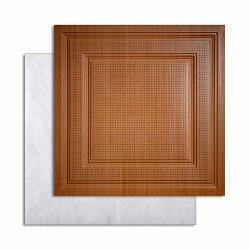 A cost effective acoustic tile system that absorbs 50% of the sound that hits it (over 70% in the common vocal range). Starting at $3.25 per sq. ft.
Good sound performance. Better than your drywall ceiling at an unbeatable price. Ceiling tiles that absorb a respectable 25% of the sound that hits them (38% in the common vocal range). Starting at $1.49 per sq. ft.